The same goes for feed readers such as the Google Reader. So it is important that you keep your RSS feed visible and useful. What is RSS? It stands for Really Simple Syndication and it’s just a common way for web sites to make their content available, primarily for use by systems (like search engines). How do I find my blog feed? Go to your blog in a browser window and click on the RSS icon in your navigation bar of your browser (see the picture below for an example of where to look). 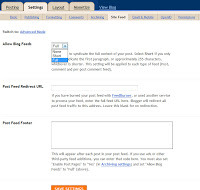 If you use Blogger then the feed is typically something like “http://myblog.blogspot.com/feeds/posts/default”. If you can, make sure that your blog feed is set to full to make sure that your content is visible. If you are worried about things like counters or missing out on ad revenue, then you should be able to paste them into your feed footer in your blog settings. I’ll talk further about monetization of your feeds at a later point. If you use Blogger, go to Settings>SiteFeed and in “Allow Blog Feeds” select “Full”. If you use WordPress then go to Options>Reading, scroll down to Syndication Feeds and make sure FULL TEXT is marked. Then go to Options>Privacy and make sure the “I would like my blog to be visible to everyone, including search engines (like Google, Sphere, Technorati) and archivers” is marked. (Thanks Bunny Cates for this description). If you use a different blog type then I don’t know how to correct it but look around at your settings. Something else you should do is make sure your feed doesn’t have errors in it. 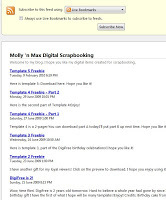 I am amazed at how many people request to add their blogs to my CraftCrave engine and their feeds have errors. This means that the software cannot do anything at all with that blog. To test your blog feed, use the W3C‘s validation site which will validate your feed against their specifications.